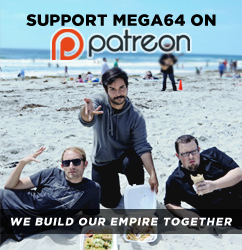 PODCAST 164 IS LIKE MEGA64 BUT WITH PODCAST 1 IN THE TITLE INSTEAD!!! Hey guys! With last weeks onslaught of new videos from us and our friends at Rooster Teeth we sit back, reflect, and film how much fun we had filming with them. We also talk about a house with bombs in it! Check it out! Audio peeps here! Come back soon. There is a new PATV video coming out soon, so soon! Edit: Sorry, we took this down for a bit and re-uploaded it, because we didn't like the horrendous thumbnail they gave us. All good now!